In recent years, bedtime stories have gotten a new rival: media devices. 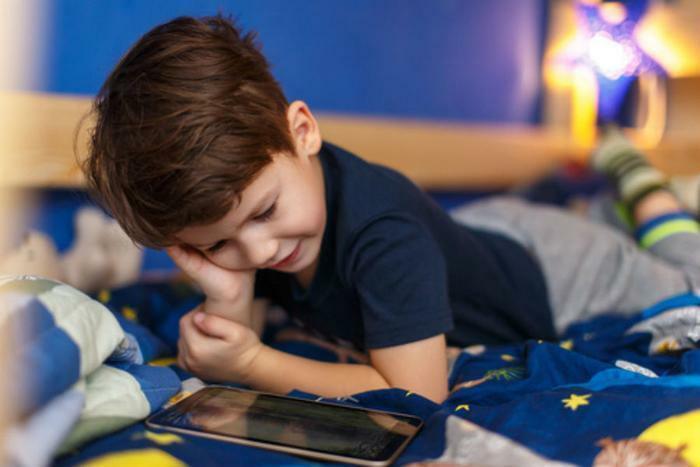 As children have become more infatuated with screens, many have developed an affinity for using smartphones and tablets before bed. But a new study finds that kids who use digital devices at bedtime double their risk of experiencing a disrupted night’s sleep. For the 72% of children and 89% of adolescents who have at least one device in their bedrooms, device-induced sleep disruptions could lead to health problems down the line. To reach this finding, researchers from King’s College London reviewed 20 existing studies from four continents. Children in the studies ranged in age from 6 to 19 (the median age was 15). They found that when kids used media devices within 90 minutes of going to sleep, the likelihood of inadequate sleep quantity, poor sleep quality, and excessive daytime sleepiness increased. The researchers also found that the mere presence of a media device could affect sleep. Simply having a media device in the bedroom, even if it was not used, was found to increase the likelihood of poor sleep. Why might media devices have this effect on children’s sleep? It could potentially be chalked up to the very nature of social media and instant messaging, the researchers say. Social media often begs kids to be constantly plugged in, ready to grab their device at any moment. This may cause them to be continuously psychologically stimulated by their device, even when it's sitting idly on the other side of the room. Screen-based media devices are thought to delay and interrupt sleep time by stimulating the brain and affecting physiology and alertness. Dr. Ben Carter notes that the study’s findings provide further proof that media devices can adversely affect sleep duration as well as quality. “Sleep is an often undervalued but important part of children’s development, with a regular lack of sleep causing a variety of health problems. With the ever-growing popularity of portable media devices and their use in schools as a replacement for textbooks, the problem of poor sleep amongst children is likely to get worse,” Carter said. Kids who don’t get a quality night’s sleep may be at an increased risk of obesity, sedative behavior, reduced immune function, and stunted growth. Poor sleep has also been linked to mental health issues. “Our findings suggest that an integrated approach involving parents, teachers, and healthcare professionals is necessary to reduce access to these devices and encourage good sleeping habits near bedtime,” Carter said. The new research is published in JAMA Pediatrics. Having trouble keeping your New Year's resolutions?